What Is a Laminate Floor With an Attached Underlayment? Vinyl flooring is thinner than most flooring types, causing it to transfer imperfections in the sub floor to the surface of the flooring over time. One way to avoid this undesirable aspect of vinyl flooring is to install underlayment before laying the floor. Underlayment is simply a thin layer of plywood that is installed to hide minor problems in the sub floor. Once it is installed, the underlayment should be carefully swept to remove any dirt prior to installing the vinyl floor. Remove all baseboards using a pry bar. Number the back of each piece with a pencil for easy installation once the underlayment and flooring has been installed. Place a piece of 1/4 inch plywood underlayment against any vertical door trim and mark where the piece hits the jamb with a pencil. Use a flush cut pull saw to cut away the piece of door trim so that the plywood will slide underneath it easily. Place the first piece of plywood underlayment in a corner and secure it to the floor using a hammer and 1 1/4 inch underlayment nails spaced every 6 to 8 inches around the perimeter of the board. Use a nail set to depress the nail head into the board, so that the nail heads can be concealed later. Attach the rest of the plywood underlayment to the floor in rows. Be sure to stagger the joints when installing the underlayment by starting every other row with a half sheet of underlayment. Spread leveling compound over the seams of the underlayment using a 6 inch putty knife. Apply enough leveling compound to fill in the depressions left by the nail heads as well as any small cracks between seams. Allow the leveling compound to dry. Sand the leveling compound until smooth using 100 grit sandpaper on a sanding block. This should remove any grooves or other imperfections, making the underlayment perfectly smooth. The existing flooring or underlayment should be in good condition before you attempt to install new underlayment. If there is obvious damage to the floor, repair or remove it prior to installing underlayment. Squeaks can usually be solved with a few well placed nails; depressions can be filled with leveling compound. Underlayment is not strong enough to carry the entire flooring load. 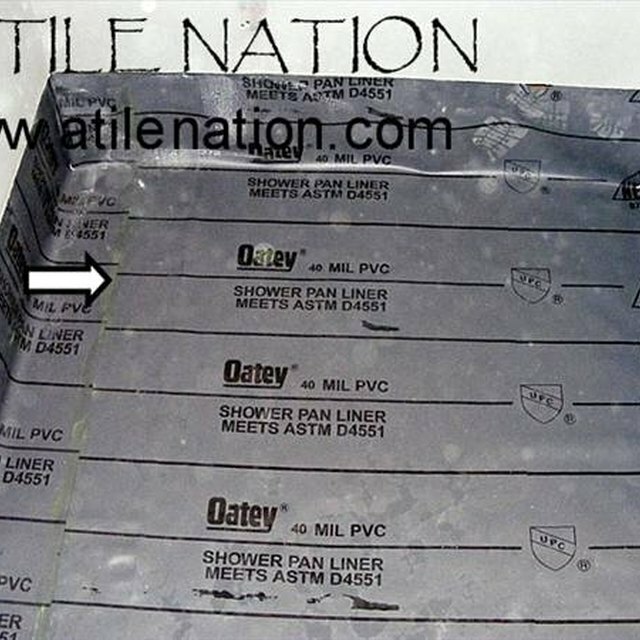 It is used to provide a smooth surface for vinyl tile installation, not offer structural support. If there is a structural problem with the existing sub floor, remove and reinstall it prior to beginning this project. What Sealant to Use to Make Tile Shiny? How Much Can Granite Hang Over? Should Shower Tile Grout Be Sealed?